Sorry for the delay in getting the prize reveal posted. I'm sure you've been at the edge of your seats! The prize for most comments left during the contest entry period is Lynette over at Crazed Mind. She is my loyal reader and comments on practically every post. She is also my neighbor and friend. Since she's seen most of the prizes I have stashed away, I asked what she'd like for her prize. She wants me to make her grape salad. She loves it and I guess she must like my cooking as well! The prize to a new follower goes to Nelsby. 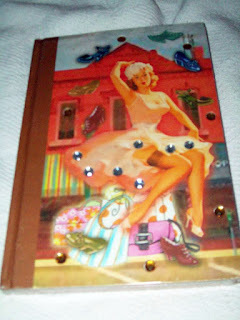 She gets this super cute little journal! 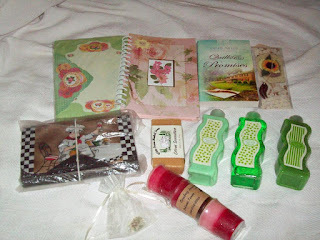 The goodies include: a stationary set, a pretty journal, a new novel, a bookmark, a coupon organizer, lovely scented hand made soap, pear scent shower gel , lotion, and bath scrub, a beautiful hand made glass tile pendant, some of my favorite votive candles form a local candle maker. I know that's not a dozen goodies, but the rest are a surprise! Congratulations Sharon! I will get an email to the winners on the day I mail these. Congratulations y'all! Check back for more giveaways soon! think i will lay in bed while i eat it like the DIVA i am. Hi, I'm your newest follower from the MBC Follow Me Club. I just wanted to thank you once again for the marvelous giveaway. I have been LOVING the journal!